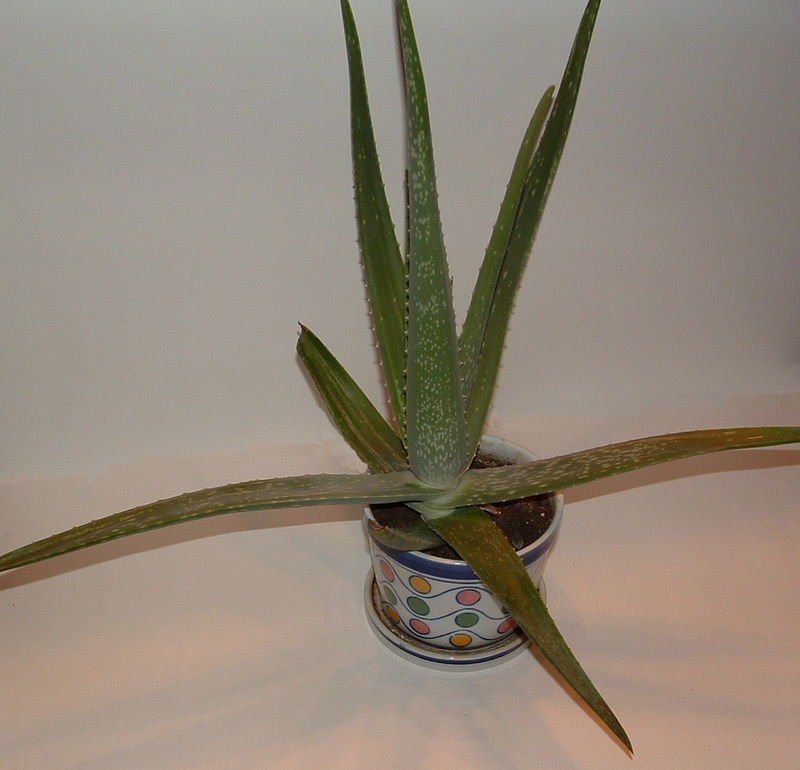 Aloe Vera plants are excellent for treating and relieving the pain from burns. Last year I bought a few small plants to have on hand for treating burns. Here is one of my larger plants that has really taken off. The key I have found is watering it just a bit and letting it dry out thoroughly between watering. The plants seem to do much better if the dirt is allowed to dry out between waterings. I had one plant that I watered too much and the leaves near the dirt began to get a rotten look so my advice is be careful not to over water your plants. To treat a burn with Aloe Vera from a plant, use a sharp knife to cut a piece of the leaf off. For a small burn, you just need a small piece of a leaf. I generally cut a piece off about the 2 inches long. You may want to cut your piece a bit smaller if you leaf is wider and has more pulp in it. Because my plants are younger, they don’t have quite as much density to them yet. You can see in the photo how the one leaf was cut at an angle. The plant stem heals itself and continues to grow if you cut it with a sharp knife as shown. Apply the gel from inside the leaf by either cutting the leaf open or squeezing it a bit to get the gel out. Once you get the gel to come out of the leaf, gently apply it to the burn. Let it soak in and apply more gel to soothe the burn as needed. I like to leave the Aloe Vera gel on in a glob which seems to really help the pain and appears to help with the healing process too. Aloe vera is a wonderful healing plant that I have been using for years. It can take the black and blue discoloration out of bruised areas too. My hubby uses it instead of creams and lotions as a general moisturizer for dry skin and I use it as a hair conditioner. My mom used to have an aloe vera plant. I don’t know why I never thought about having one. I really need to get one now. I like some of the ideas that Timethief shared, too. Aloe vera is wonderful for the skin, including summer sunburn! I could use a plant for this summer. Thanks for sharing! Aloe vera is great stuff with a multitude of uses. There are so many benefits that you can get from aloe vera aside from its moisturizing properties.